1 Pass out a Bidding Meeple, Player Board, and $20,000 in Currency Cards (three $5K and five $1K bills) to each player. Place the remaining currency cards next to the board. 2 Place the Turn Marker on the calendar space on the game board that corresponds to the number of players. 3 Place a Stock Ticker on the starting values of each stock, indicated by darkened circles. 4 Shuffle and place the Company Cards and Forecast Cards next to the board in separate piles. 5 Pull out one of each of the six different stock cards from the Market Deck and deal one to each player. Each player places this stock face down in the Stock Portfolio spot of the player board. This stock functions normally as other stock obtained during the game. Place any extra cards back in the Market Deck, shuffle and place it next to the board face-down. 6 The game begins with the player who paid the most for their previous meal. Give him/her the First Player Token. 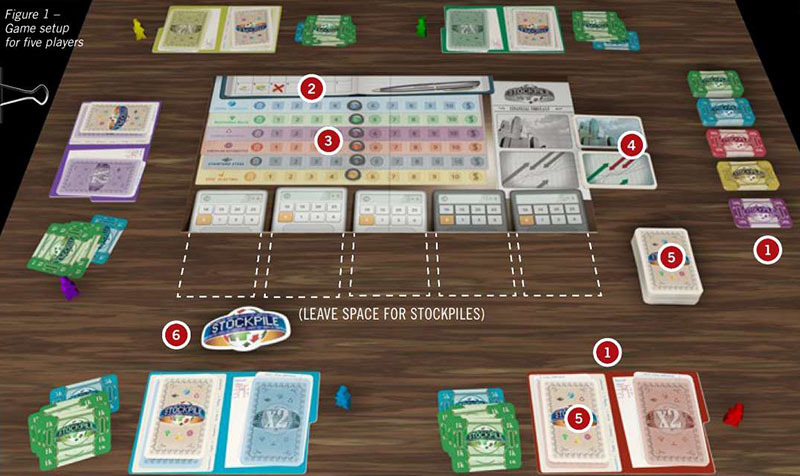 Stockpile is played over several rounds based on the number of players (see Figure 2). Play begins with the player with the First Player Token and continues clockwise. At the end of each round, pass the First Player Token to the next player on the left. The number of rounds played is based on the number of players as indicated on the board. The Turn Marker tracks the number of rounds left in the game. During the Information Phase, each player receives a Company Card and a Forecast Card. Company Cards are paired with Forecast Cards to indicate the movement of a stock's value. Stock value movement takes place at the end of the round during the Movement Phase. 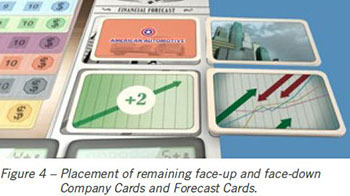 Example: In Figure 4, the American Automotive Company Card is paired with the +2 Forecast Card. Therefore, during the Movement Phase, American Automotive stock value will increase by two. Deal one Company Card and one Forecast Card to each player. Note: Each player should look at his/her cards and keep them hidden. The cards provide insider information that should be used to make decisions during the Demand and Selling Phases before stock prices change in the Movement Phase. Place one Company Card and one Forecast Card face-up on the board. This stock value change is public information. Pair any remaining Company Cards with Forecast Cards and place the pairs in separate piles face- down next to the board. Note: These cards will be used at the end of the round during the Movement Phase. For a three-player game, two pairs will be placed face-down. For a four-player game, one pair will be face-down. No pairs will remain for a five-player game. During the Supply Phase, players place cards into Stockpiles. These cards may be shares of company stock, trading fees, or action cards. Stockpiles represent the market supply, and they are bid on and obtained during the Demand Phase. Flip one card from the Market Deck face-up to start building each Stockpile. Stockpiles are formed under the calculators at the bottom of the board. 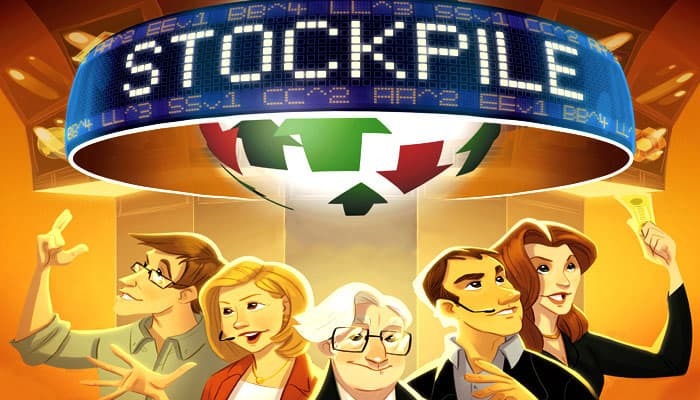 The number of Stockpiles in each game is equal to the number of players. Deal two cards from the Market Deck to each player. Players must keep these cards separate from any obtained earlier in the game. In turn order, each player places both of their two cards in any Stockpile(s) in the game. One card is placed face-up and one card is placed face-down. Note: The cards can either be placed in the same Stockpile or different Stockpiles. 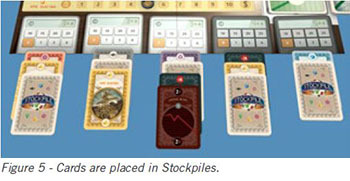 Cards may not be placed in the 4 or 5 player Stockpiles if there are not enough players in the game. Be sure to fan the cards out so everyone can see how many cards are in each Stockpile. Once all players have added their cards to the Stockpiles, bidding begins in the Demand Phase. The Demand Phase is when players acquire a Stockpile built during the Supply Phase. The Bidding Track represents the demand or the value to be paid in money for the corresponding Stockpile at the end of the phase. In turn order, each player places his/her Bidding Meeple on an open number of any Bidding Track they choose, including those tracks with bids already on them so long as the bid increases. Note: A player may not bid more money than they currently have. How much money a player has is public knowledge. If, and only if, a player is outbid by another player (i.e., another player placed his/her Bidding Meeple farther along the same Bidding Track), then the outbid player picks up their Bidding Meeple and re-bids on their next turn. Note: The re-bid occurs only after all players have had the chance to bid once. If multiple players outbid each other, re-bids proceed in clockwise order. The re-bid may be placed on the same Bidding Track or a different one. If there are no further open spots on a Bidding Track, then that Bidding Track is locked: the maximum bid is $25,000. You cannot underbid or match another player's bid. Bidding continues until all Bidding Tracks have one Bidding Meeple on it. Players pay the bank the amount of their bid, collect their Bidding Meeple, and pick up all of the cards in the Stockpile they purchased. Note: A player may end up bidding and paying $0 for a Stockpile. 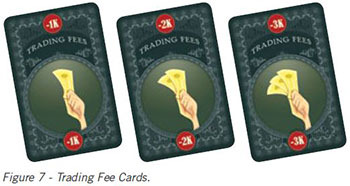 If a player's Stockpile contained a Trading Fee Card, the player pays the bank the amount listed. Once paid, Trading Fee Cards are placed face-up in the discard pile next to the Market Deck. Note: If players do not have the funds to pay for the trading fee, they must keep the card, placing it face-up in front of them. Any trading fees held this way must be paid immediately upon receiving enough money. 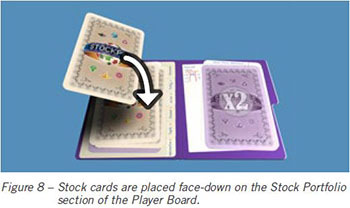 Place the remaining cards obtained in the Stock Portfolio section of the Player Board face-down. Note: Stock cards obtained during the game should be kept secret from other players. A player may look at which stocks he/she has at any time. 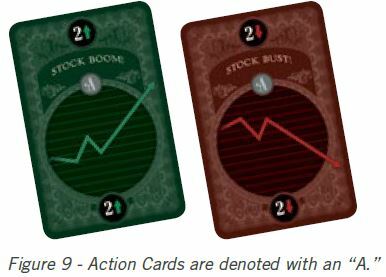 In the Action Phase, players manipulate the markets using action cards. In turn order, each player uses all Action Cards obtained during the previous Demand Phase, afterwards placing them face-up in the discard pile. Stock Boom! - for each Stock Boom, a player chooses one stock and moves the value up by two. Stock Bust! - for each Stock Bust, a player chooses one stock and moves the value down by two. Note: A player must select one stock and increase/ decrease its value. If a stock's value reaches the Stock Split or Bankruptcy space, follow the rules found under the Movement Phase. Action Cards must be played during the same round which they were obtained. The Selling Phase gives players an opportunity to sell any shares of stock that they currently own. They should use the knowledge from the Information Phase to know if and what stocks to sell. 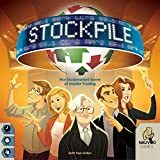 In turn order, players may sell any number of stocks that they have obtained by placing them face-up in the discard pile and collecting money from the bank equal to the stock's current value for each stock. Note: Stocks sold from a player's Split Portfolio pay two times the value of the stock. Players may alternatively move a stock from their Split Portfolio back to their regular Stock Portfolio to receive one times the current value of a stock from the bank. This represents selling only one stock from a split stock. See Movement Phase: Stock Splits for more information on split stocks. During the Movement Phase, stock values move according to the Company and Forecast Cards dealt during the Information Phase. 1. 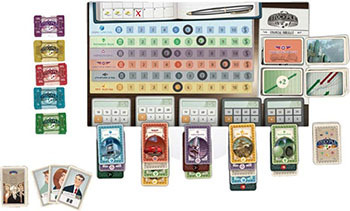 In turn order, players reveal their Company Cards and Forecast Cards and move the stock values accordingly. 2. Move the remaining stock values according to the face-up and face-down pairs of Company Cards and Forecast Cards on top of and next to the board. All stocks will be affected every round. 3. The Forecast Card labeled "$$" means a company pays out dividends. The stock value does not change. Instead, each player immediately receives $2,000 for each share of that company's stock in his/her portfolio. Note: A player will receive twice the dividends for stock in his/her Split Portfolio. A player must reveal shares of stock to receive the dividends for it. He/she may choose not to collect on some or all of that stock to avoid revealing how many shares they have. If a stock's value ever increases to more than 10, the stock splits. A stock split effectively doubles your existing shares for that stock. When a stock splits, all players who have stock of that type in their portfolio will reveal it and move it to their Split Portfolio face-down. If the increase causes the stock's value to land exactly on the Stock Split space, then the value of the stock returns to 6. If the stock's increase would move the value further than the Stock Split space, reset the value of the stock to 6 and continue to increase the stock's value. Epic Electric's stock value was listed at 9, and its Company Card was paired with the +4 Forecast Card this round. Epic Electric reaches the Stock Split space by using only two of its +4 movement. The stock value resets to 6 and continues to increase for the remainder of its move. Thus, Epic Electric's stock value would be set to 8 as a result of this movement. Any new stock obtained after the stock split goes in a player's regular Stock Portfolio, not the Split Portfolio. If a player already owns a stock in his Split Portfolio and that stock splits again later in the game, then that player receives $10,000 in Currency Cards for each Stock Card of that type in their Split Portfolio. The stock then remains in the Split Portfolio. If a stock's value ever moves below 1 on a turn, it immediately goes bankrupt. All players discard all stock of that kind that they own, including any stocks in their Split Portfolio. Return the stock's price to the starting value of 5. The round ends after the Movement Phase. If the Turn Marker is not yet on the right-most spot of the calendar, move it one spot to the right. Pass the First Player Token one player to the left, and start another round. If the Turn Marker was already on the right-most spot of the calendar then the game is over. Continue on to The Game End. The game ends at the end of the final Movement Phase. Any cards leftover in the Market Deck will not be used in this game. All players reveal how many shares of stock they own for each company to determine the majority shareholders. A majority shareholder is the player with the most stock in any company. Note: Shares in player's Split Portfolios count as double when determining majority shareholders. The majority shareholders of each company receive a bonus of $10,000. If there is a tie, all tied players receive $5,000. Each player then sells back their shares at a price equal to the final value of the stock. Note: Again, any shares in players' Split Portfolios count as double. Add up each player's Currency Cards. The player with the most money, and thus the greatest net worth, wins.